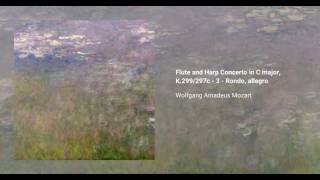 Wolfgang Amadeus Mozart wrote his Concerto for Flute, Harp, and Orchestra in C, K. 299/297c in 1778. 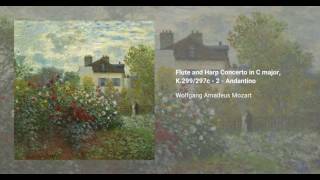 It is one of only two true double concertos that he wrote, as well as the only piece of music that Mozart wrote that contains the harp. It was commisioned by Adrien-Louis de Bonnières, duc de Guînes, for his use and for that of his older daughter, Marie-Louise-Philippine. At the time, the harp was still in development, and was not considered a standard instrument, and Mozart's opinion of it was at best dubious, as he never again composed for it. In fact, the harp part appears to be more like an adaptation of a piano part. The piece is essentially in the form of a Sinfonia Concertante, which was extremely popular in Paris at the time. 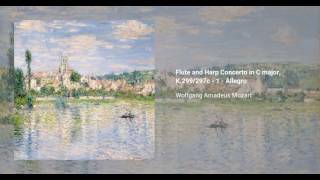 The piece is one of the most popular such concerti in the repertoire, as well as often being found on recordings dedicated otherwise to either one of its featured instruments. Eventually Mozart came to despise the nobleman who commissioned it, who never paid the composer for this work.